When we lived in Stellenbosch South Africa, I enjoyed all the wonderful tennis traditions we had there; Saturdays’ social games, rooibos tea for the thirst, tennis evenings until midnight with families and barbecues afterwards, league matches in Wellington where the heat drives everybody under the sprinklers on the grass before the third and final set is taken on. In England we got hooked on the lawn tennis and of course all the wonderful British traditions…yeah, yeah, maybe a bit stiff on tv, but when you’re part of it…complete different ballgame! We religiously wore our white attire on the courts and became proud of it…the carefully attended, lovely lawn courts just asked for nothing less than pure white. Happy chaps they are, the Brits on the courts…full of fun, very courteous and full of love for the game of tennis. We grew to love the cucumber sandwiches after an afternoon of tennis, some more tea, not forgetting the beer, beautiful clubhouses….a wonderful picture of tradition that deserves nothing but respect and admiration. It is a wonderful thing…playing on grass. And I should mention…I have had my most attractive coach there in England, can’t really say whether that forms part of the tradition, but nonetheless, he did wonders for our tennis. In South Carolina we had a ball! Now…. I have to be careful, since so many reading here, will be from the dear old USA? We loved it. Nothing less than perfect tennis courts, perfect clubhouses, everything you need at close hand, the latest fashions in gear widely available(I always looked stunning on the courts, so much so that my game started deteriorating…), drinks and eats to hearts desire, a very relaxed atmosphere(the game of tennis can stir up emotions from time to time, depending on how far you trail behind) and a great coach always close at hand to help with that crappy backhand. In France we have the wonderful clay courts, which is my first choice of surface, followed by grass. Probably because it is so much gentler on all these joints. And I do enjoy the tradition that comes along with playing on a clay court. Some might find it tedious, I love it. We only play on the clay courts in summer, after they have been prepared. And this is what my sketches are all about; the sweeping of the courts, clearing the lines, sprinkling the clay and you have this beautifully prepared court ready for the next game. There is something very sporty, very adrenalin like, very professional like about sliding on the clay, giving the line a sweep with your foot just before you serve, cleaning your soles against the racket, dusting some red clay from your clothes, oh, and a big one…checking the lines for the mark! OK, it is all for the show, but it is still part of tradition and there will always be something to be said for it. These figures look so perfectly casual! And the colours are vibrant and lively. 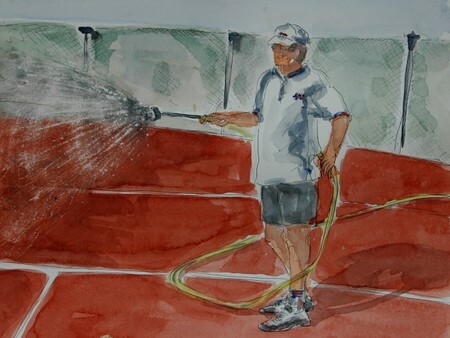 I get that sense of the warmth of the courts and the fresh smell as they hose them. Beautifully observed and painted. I never learned to play tennis, but reading your post sure makes me understand a bit more about the game – and about the traditions. This is very informative and interesting. Your drawings are fabulous! In the first one, where the man is dragging the smoother behind him, I could feel the tug of resistance of the board sliding across the court. This is a super post! AMAZING — SIMPLY AMAZING! I LOVE YOUR STORY AND ADORE YOUR FIGURES! YES THEY LOOK SO CASUAL — AND JUST WONDERFUL~!! These are such lovely loose paintings – and I love the color of the clay. Were these from photos from your days on the courts? These are terrific sketches…i used to play on clay courts here as a kid..now they are that composite stuff…the old courts are still there but closed…too high maintenance i suppose…oh heres a story for you …my fil played at Wimbledon back in the 20-40s BAREFOOTED because he always played on clay courts here…of course what do you suppose they wore for shoes back then?? NO idea! You have a gift for telling a story so that one and all can envision themselves right there. Last year for the very first time I played tennis … it turned out to be a comic routine. Very funny watching me stumble across the court.I love the clay color you captured in you paintings… and the movement you’ve accomplished with your figures is outstanding. Bravo! Hi Ronell, thanks for sharing your tale about tennis traditions. Besides being a great artist, you’re also a great storyteller!. Your words and pictures bring back memories of playing on clay courts in Barcelona. Your sketches are delightful and looking at them I feel I can smell the court right now and get ready to play. Btw… did you watch the Nadal-Federer clay/grass match? Fascinating and touching, too, Ronell. You certainly have joie de vivre—-your stories, your paintings and your self portrait in the upper right corner of your blog are proof of that! I love the colours and that you decided to paint the groundsmen(?) rather than the players. My favourite is the guy with the hose – the way he has it wrapped around him. And how did you get that water looking so good? Lovely sketches, Ronell, and I agree with Laureline about your portrait – I admire it anew each time I visit. Diane. This was an interesting read, Ronell. It’s funny, I was sipping rooibos tea as I was starting to read this wonderful story. One’s life, without tradition would be a very empty one. It is vital that we keep it. 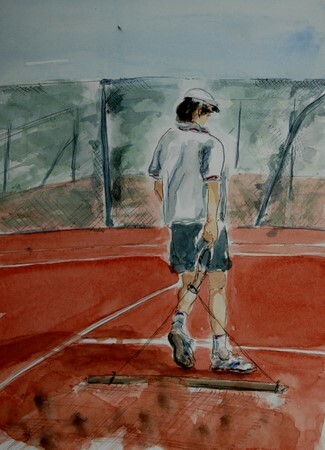 Your love for the clay court shines through these paintings of yours. Great job. These figures are just gorgeous!! So full of life and love the colors. You’re figures are so full of life and not one of them stiff looking. These are great. I loved your commentary btw. I could feel your excitement for the game and it’s traditions. Hi Ronell ! These are beautifully done, I just love the colors you’ve chosen. The contrast between the intense red of the clay and the tones of grey elsewhere is very effective. Sarah, I used some sanding paper to scrape away some water..Gabi, if I can help it, I don’t miss a Nadal match and the two of them just make for spectacular tennis, being such opposites in style and chatacter!You’re a tennisplayer too I see..who knows, maybe one day we’ll be on the same court?Shirley, my camera is always with me. I played tennis with Hartman a few ays ago and took some photos afterwards when he was cleaning the courts and when I downloaded them at home, I thought that they would make nice little drawings..
Nancy, every time I’m on the court it makes for a comic routine..I just love so much being on it, that I tend to be over enthousiastic, so stumbling does come to mind! Maggie, barefooted at Wimbledon…great, I’ll have to have a look at the records of those years, this will be fun! I delighted in reading your post. (Britains first lawn tennis club is just 5 minutes up the road from me) I walk the dog past it sometimes in the evenings, and enjoy the sunshine and gentle thwack of the ball. I think your paintings capture the people so well and I love the colour of the clay. Wonderful sketches and glorious colors. Did you do these on site or from photos? I saw your note that you always carry your camera (me too) so I guess you did them from photos. Either way they’re terrific. It sounds like you’ve led such an interesting life, living in so many countries. I look forward to reading more such stories.